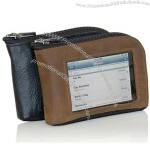 Trendy leather/PU wallet with money compartment and 6 spaces for cards, with extra rear compartment. 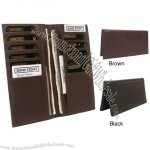 Rugged bi-fold design with fold out ID holder and window. 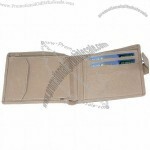 Includes eight credit card slots and a full length money sleeve. 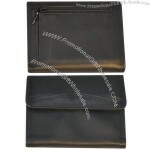 Includes an exterior pocket for receipts or business cards. The lining is 18 Oz. washed canvas. Pay your bill in style! Now you can forget about the economic downturn as you walk around with unique wallet that looks like a stack of one hundred dollar bills. Simply insert this wad of realistic 100 dollar bills into your back pocket to create the illusion of wealth. iPhone, Cash, Cards and Carry. You're set with your wallet contents plus your iPhone—all in one compact, leather case. Rather than taking two separate items, now you can put your iPhone into the iPhone Wallet along with your cash and credit cards and head out the door. The front window on the iPhone Wallet lets you both see and use your iPhone without needing to take it out every time someone texts or calls. For long calls you may want to take the phone out, but when needed you can talk right through the case. Available in brown or black, naturally-tanned leather, the iPhone case has a rigid Ultrasuede® divider that keeps your iPhone safe and separate from pockets to hold the rest. The iPhone Wallet. Simplify your life. The iPhone Wallet comes in two sizes—one to fit the iPhone 5s, iPhone 5c, iPhone 5, and one to fit the iPhone 4s with or without the Bumper. 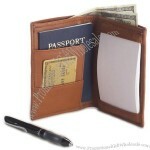 The Genuine Leather Money Band Wallet is an elegant and simple money band wallet. 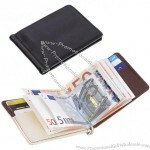 The Genuine Leather Money Band Wallet contains 2 card pockets and one main money band in the middle. The size for this money band wallet is very compact and handy, it will fit perfectly into any pockets without stretching. It will also free up your space in your purse or suitcases too! The Genuine Leather Money Band Wallet is a very spacious wallet. It can fit not only bills but also cards as well! It can hold up to 10 bills and 6 cards! 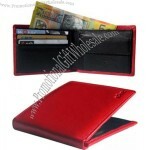 It’s also a great gift to give for any one that likes something simple and does not like the conventional wallets. Dimensions： 7.8 x 3.1 in. Daring notorous and connected. Its eye catching design features: - 4 credit card holders - Coin Pouch - Note holder This high quality classy eye catching wallet is made of high grade Ultra soft leather so not only does it look great it feels great in your hand or in your pocket. The Columbian is driven evasive and dangerous. The perfect teenage gift!Monk Wallets- Blessing your pockets with good fortune! 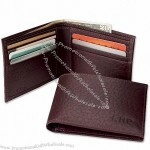 The real leather wallets are one which last for a long period of time without undergoing any wear or tear. The bison Thinfold leather wallets accomplishes exactly the same thing as providing you with a high quality finished product. 3½"H x 4½"W folded. The wallet is crafted by American bison leather containing twelve credit card compartments which can be accessed easily, translucent sleeve for ID and photos. Leather-lined currency pouch. Dimensions: 4⅜"H x 4½"W folded. 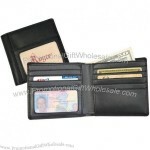 Bison leather wallet is a high quality wallet containing one credit card slot. 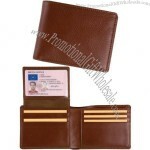 The wallet has a simple flap system for holding the required money.Bison leather wallet in brown. 3¼" x 4¼" folded. Genuine American bison leather. 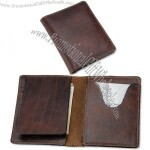 Carry your cash in style with this bison leather wallet for men. This Jotter wallet contains a small notepad which can be used to jot down important information and lecture notes. 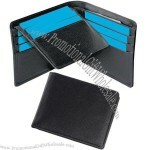 Featuring a pen loop (pen not included); business card or credit card slots; and a divided top billfold. The perfect go to jotter. 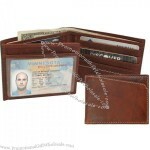 Product Name: Leather Double ID Hipster Wallet 4" x 4 1/4"
The original leather hip wallet contains one interior compartment, one exterior ID compartment and a large 8 credit card pockets for easy use. Available in Black and Coco. Dimensions: 4" x 4 1/4". 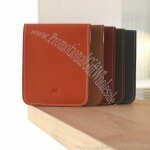 The soft leather hip wallet contains a padded cover and two note compartments with cc pocket and driving license pocket. When travelling Internationally, you have to show your standard. 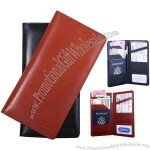 You have to own the premium leather wallet to help in your travel and to show your status. As the name suggests this product is for the ‘La Crema’ of the society. The Bi-fold wallet is made from the finest leather available in the country and will last for a long time. 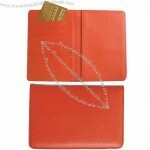 The beautifully designed leather wallets give you a great feel. The wallets hold credit card slots, interior slide pockets, billfold section and thus, render great storage options to keep your important papers, money and cards. 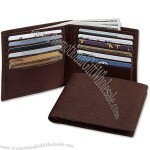 The leather wallets make things easy for you by accommodating so many things at one place for you. 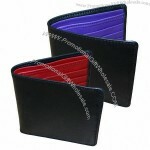 The wallets are available in various sizes and colours. As per their size, you can put in things in them. These wallets are a practical and stylish for any man of any age. You can even customize the wallets with your company name and brand logo and use it as promotional strategy by gifting to clients. 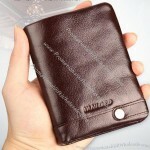 Custom-made Leather Wallet From China Factory, Low price Leather Wallet, Top Quality, True wholesale source for original!